Convertibles that can jump between being tablets and full-on notebooks are becoming an increasingly popular option due to both the design of Windows 8 and, to a greater extent, the gradual convergence between those product types. We're not quite at the point where anyone has nailed it without making some kind of serious sacrifice, but we're definitely getting there and the experimentation by different vendors is nothing if not interesting. 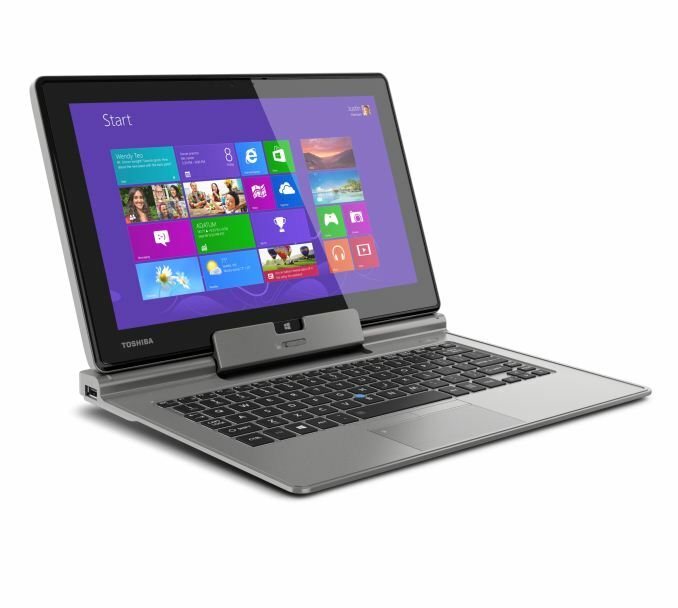 Enter Toshiba's Portege Z10t. Unlike most full x86 tablets currently available, which use either Intel's current-generation Atom (thus sacrificing performance) or 17W Ivy Bridge (thus sacrificing weight and heat), the Z10t is coming out of the gate with 13W Ivy Bridge. It also includes 4GB of DDR3, a minimum 128GB SSD, and per its business-class design, supports vPro. The Portege Z10t also features an 11.6" 1080p IPS display, but unique to it is a special fingerprint-resistant coating that I found vastly preferable to the traditional glass used on tablets. My fingertip was able to move comfortably and virtually friction free across the surface, and Toshiba also includes both a pressure-sensitive primary stylus and a secondary one mounted inside the chassis. Toshiba is also using a Wacom digitizer for the Z10t. Where the Portege's convertible design differs is in the design of the keyboard dock; it's weighted in the back with additional ports and designed to easily close like an ultrabook, but there's no additional battery inside the dock itself. Toshiba will also be offering a separate port-replicator dock to use with the Z10t. The tablet half is 0.53" thick and weighs a hair under two pounds; with the ultrabook keyboard dock, that weight goes up to a still svelte 3.1 pounds. It's expected to be available soon starting at $1,499. What? How does this make any sense ever unless you (probably) are just trolling? Atom is already in tablets and phones. Bay trail, kabini, and temash will all be in tablets/ultraportables this year for under 300$. When you combine the high profits that MS and Intel are used to making per x86 device (especially in the 90's), you have giant corporations with bureaucratic nightmares, layers and layers of managers with ever fewer employees with real skill, and all of them in a delusion that they can have those glory days again if they just introduce this one feature that will make everyone realize they really should pay $1500 for a tablet/laptop hybrid with Windows 8 Pro. The world changed and they fail to understand why it changed, though they have some inkling of at least HOW it changed. They're like your grandpa that refuses to acknowledge the year is not 10 years ago when he still could do things (since now he can't). He thinks you're like you were 10 years ago, he thinks everyone is. He remembers his glory days and remembers nothing BUT those glory days no matter how hard reality keeps slapping that delusion down. The sad thing is if Intel and MS don't stop screwing around with these high profit margins they keep expecting, they're going to wind up become business-only niche players in computing devices. Now there's money to be made there, but it won't be those huge profits they're used to and Intel will certainly have to start doing a lot of fab'ing for others if they lose the consumer market they've got a lock on right now. Then again, perhaps they both want to play out The IBM Story Part Deux: The Movie, tag-teaming the role of IBM in shifts. At least Intel is showing signs that they realize that a corporate shift is necessary with their changes to management and organization. Ballmer at MS is so afraid of being remembered a failure of a CEO after Bill Gates that he refuses to 1) let anyone get close to the Big Chair even as potential successor and 2) acts like the guy who looks out at a crowd running by and asks, "Hey! Where is that crowd going? I need to know so I can lead them there!" Like an ADHD kid, they bounce here and there, everywhere, with no cohesive vision, just a hodgepodge of everyone else's ideas crudely and poorly stitched together as devices and platforms. "just a hodgepodge of every else's ideas crudely and poorly stitched together as devices and platforms."